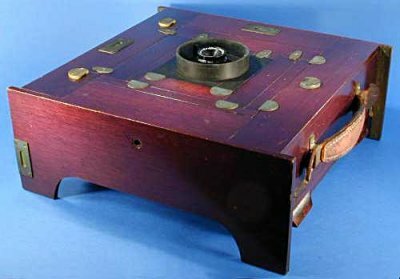 This odd-shaped camera has a famous story behind it. In the 1940s, Bill Brandt was tipped off by a friend about an interesting camera in a local antique shop in London. He bought it and subsequently used it for his project Perspective of Nudes which became a key book of 20th century photography. Vintage copies now sell for $1200. 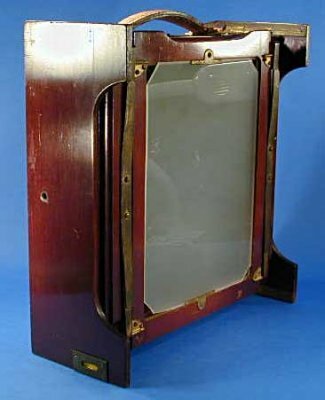 What Brandt had bought was a rare Kodak Wide Angle Camera with Zeiss Protar Lens, used by police for recording crime scenes. 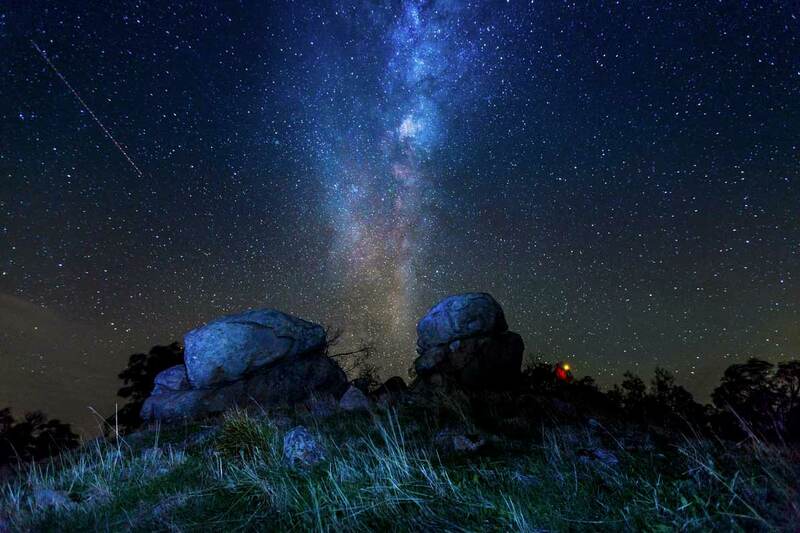 The wide angle lens captured the whole scene while the small f45 aperture gave full depth-of-field. Essentially it was a fixed focus box camera allowing untrained coppers to get the shot on the generous full plate film. 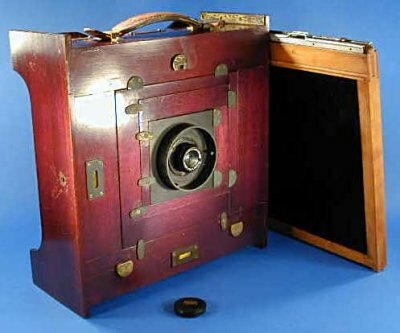 The lens was a Carl Zeiss Jena f18 Protar of 85mm focal length, giving a very wide 110 degree angle of view, equivalent to 15mm lens on 35mm format. These cameras are extremely rare, perhaps only made for the police force, but John Rushton’s website has one and you can see all the details. It is an original design, as the pictures show, with curious features such as the small “feet” on the back which allows you to lay it on the ground to shoot vertically up. Bill Brandt was one of the greats and he did some of his greatest work on this camera. 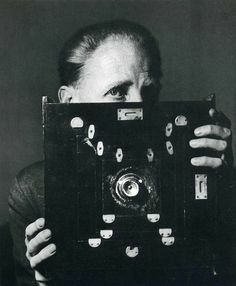 The well known 1945 portrait by Laelia Goehr shows him holding up the camera in front of his face; it must have been taken near the time of purchase and he clearly knew he had found a great new tool. Each year when I trek out to see the Bowness exhibition at the Monash Gallery of Art, I’m impressed with the high standard of the work and its technical polish. It’s where the “grown-ups” show. 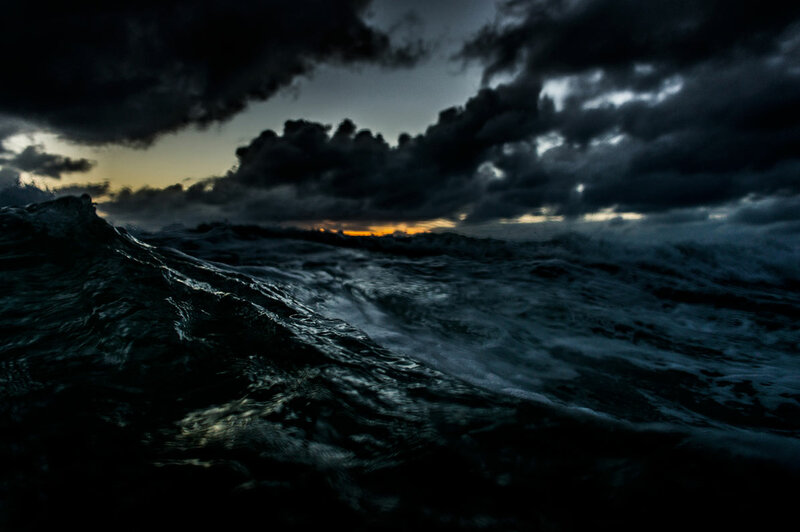 The annual $25,000 non-acquisitive William and Winifred Bowness Photography Prize is an initiative of the MGA Foundation. This years judges were MGA Senior Curator, Stephen Zagala, Karen Quinlan and Bill Henson. This year there’s a wealth of beautiful, well-presented work, so good that it sets the bar for the rest of us – I suppose that’s what the competition is for. 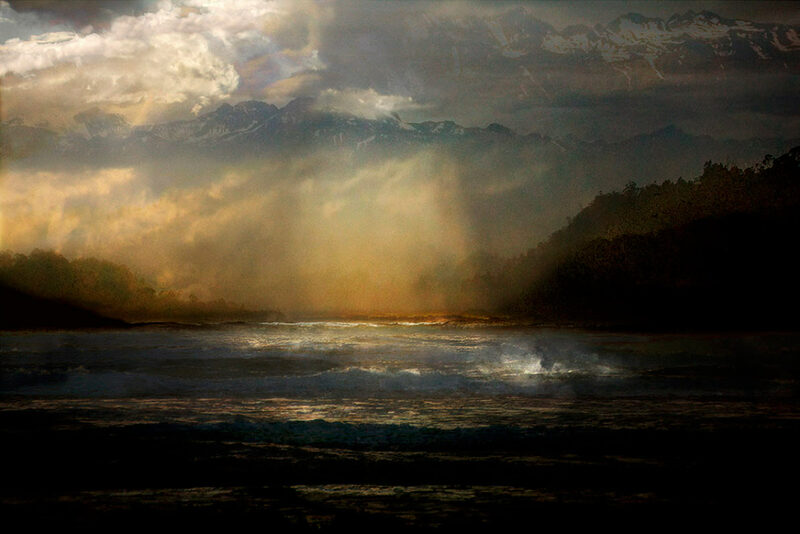 On this occasion the emphasis is on nature and landscape. It will show you how many people here are working in that genre, understandable when you consider the size of this continent. You could say the landscape is broadly divided into two approaches. There are more or less traditional takes on the landscape, realistic and often epic, where the photographer trusts the eye of the camera. And then there are more idea-based landscapes, some of them literary or historistist, or post-modern, if anybody still uses that term. In the first category, Murray Frederick and Che Chorley use the camera as witness. The scenes they capture convey that sense of awe and dread in front of nature that 18th century poets and painters called the sublime. 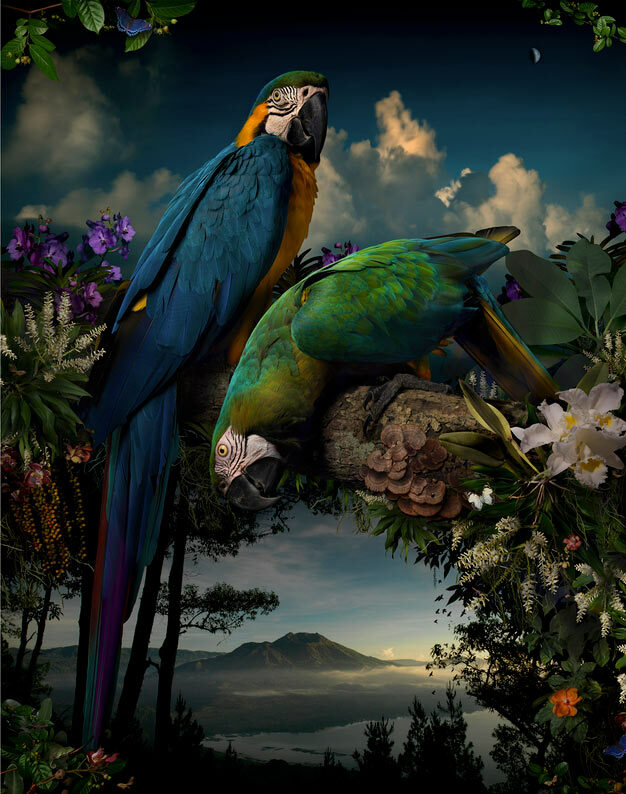 In the second category, the work of Valerie Spark and Joseph McGlennon show nature re-formed through collages of photos joined together to make fictive scenes. They don’t pretend to be real. 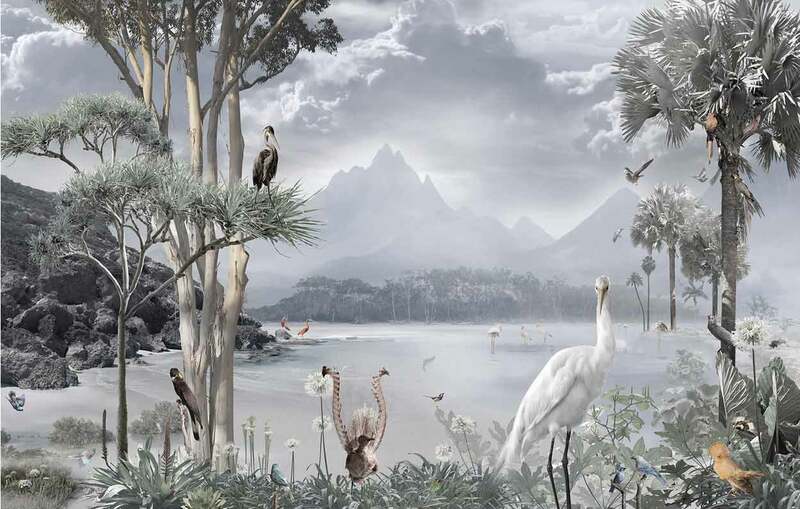 McGlennon’s prize-winner evokes the large scale bird paintings of Gould and others. 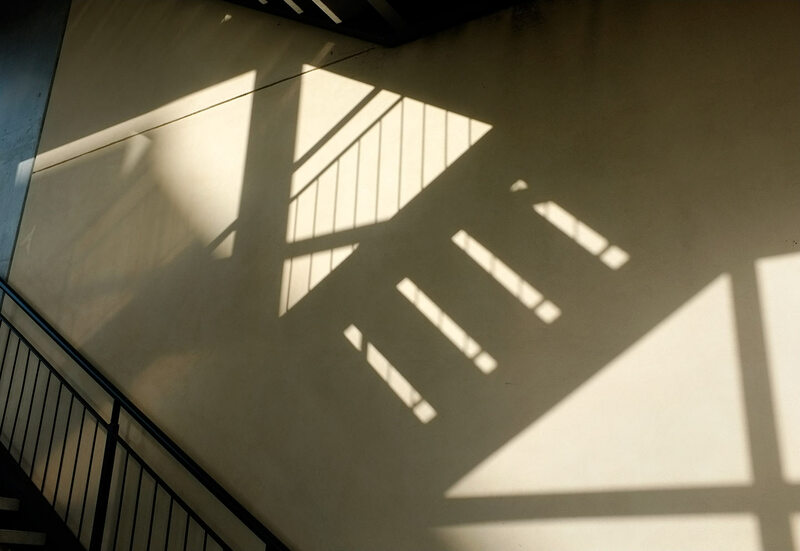 Rebekah Stuart takes photographs at various locations and layers them subtly to resemble antique paintings. 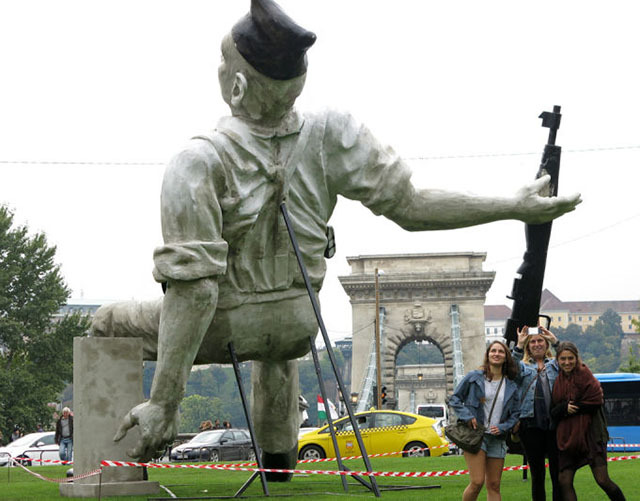 Hungarian artist Hervé Loránth Ervin has created a bizarre sculpture based on Robert Capa’s photograph of the falling soldier. 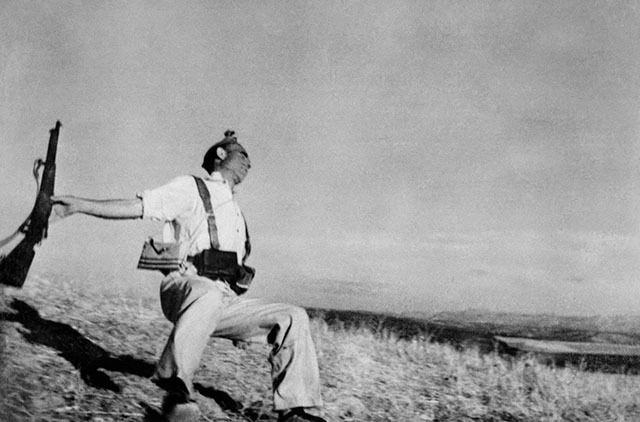 The famous image was taken during the Spanish Civil War and supposedly shows a Loyalist soldier felled by a sniper’s bullet. It was taken in 1936. Robert Capa was born in Budapest in 1913 and the sculpture is displayed in a park there as part of the Budapest Art Market. Mercifully it will come down later in the year. Despite its clumsiness as a reproduction of the photograph, it is still an interesting example of what I call Photography by Other Means. This is where photography is engaged through means other than photography itself, in this case through sculpture. The essence of Capa’s photograph, an instantaneous capture of a fleeting moment in time is usually presented in a two-dimensional sheet of silvered paper, a darkroom print. Here it has morphed into a 7.5 metre tall, four ton, three-dimensional object. Without Capa’s photograph the statue would not exist – it can only be understood in reference to the photograph, so in a sense it is a photograph, but one that was not achieved using photography. On another level it can be viewed as a Surrealist sculpture, an absurd reversal of the intrinsic qualities of a photograph. Capa’s image was taken in a fraction of a second but the sculpture took much longer to craft. 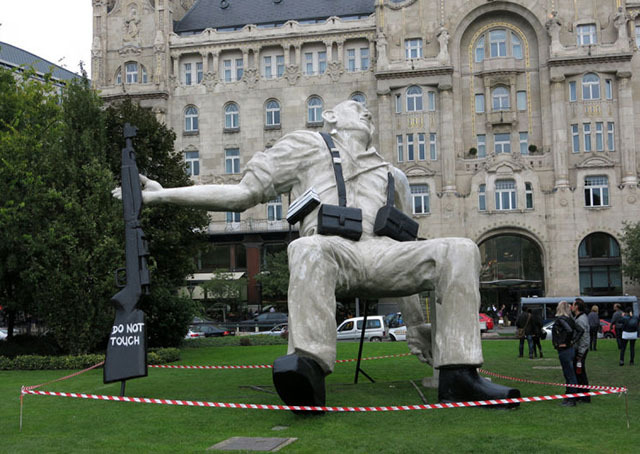 The photograph shows the soldier shot in Spain but the sculpture has him falling in Hungary. The microscopic particles of silver that make up the Spanish soldier weigh almost nothing, but the Hungarian soldiers weighs tons. It is a series of paradoxes that might interest Rene Magritte. All this ignores the bad taste of exploiting a man’s death in this way, but that’s another matter. 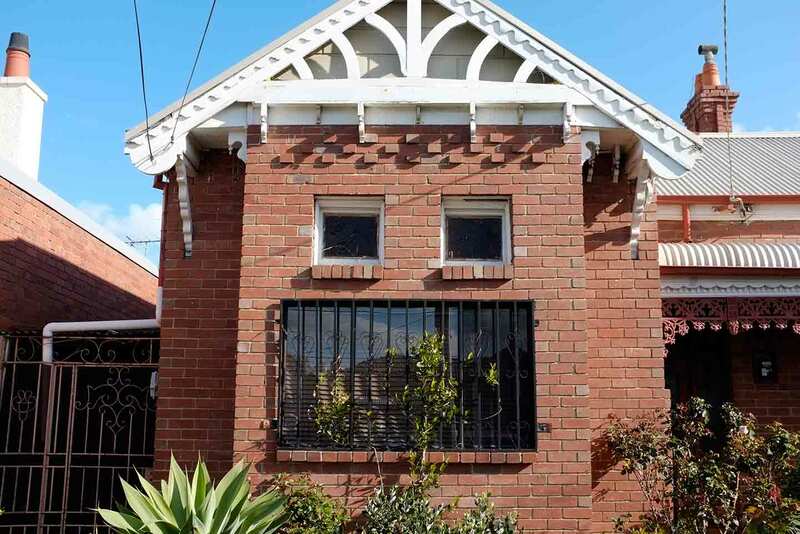 Eadweard Muybridge has landed in South Melbourne. 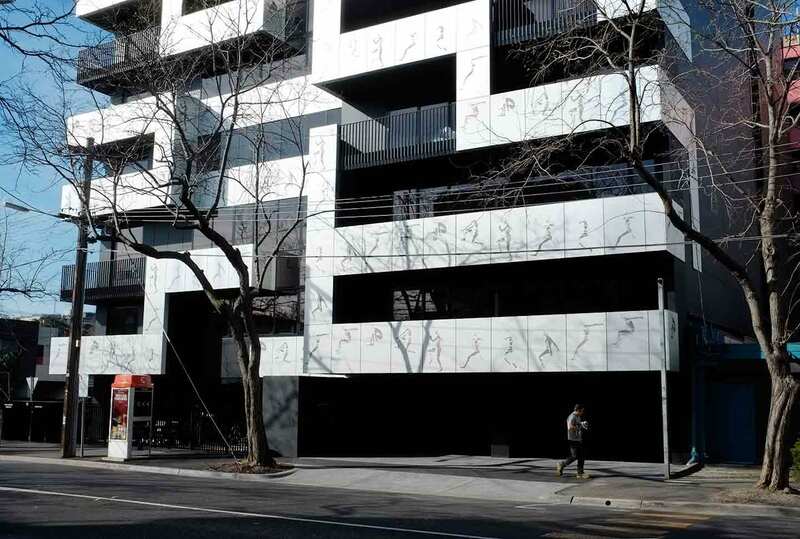 A prominent architectural firm has designed an apartment building that celebrates the great 19th century photographer of Animal Locomotion. 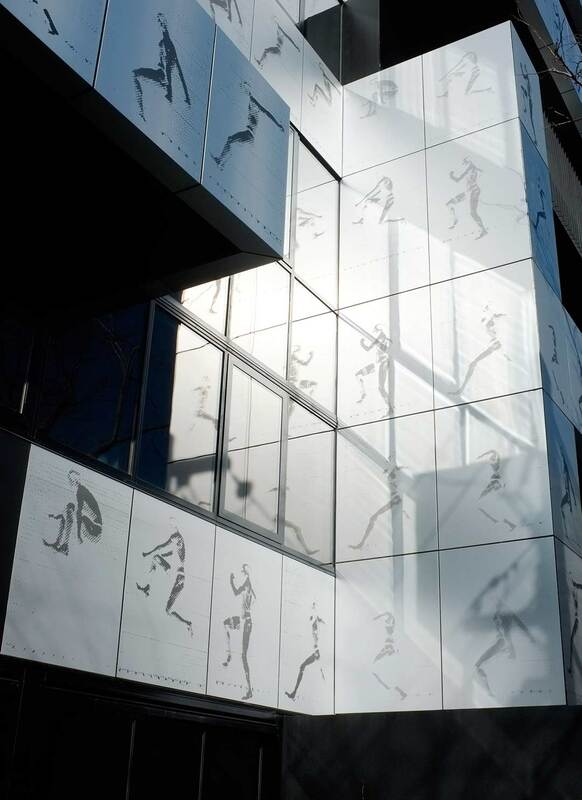 It’s facade has rows of his leaping figures in shiny etched panels. Designed by architects Ashton Raggatt McDougall and inspired by Melbourne’s sporting heritage, the energetic motif represents human endeavour, individuals in action and life as a never-ending journey. Momentum can be found at the corner of Eastern Road and Palmerston Road in South Melbourne. 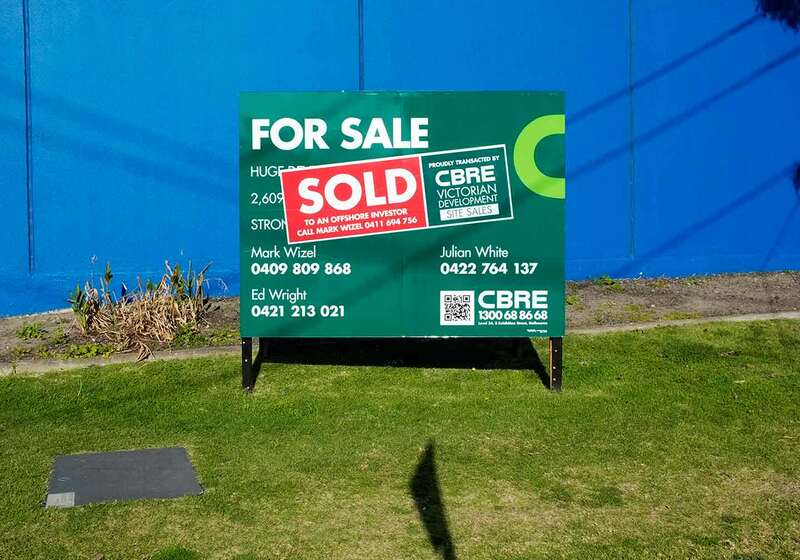 It’s in a very appealing, villagy location, opposite a local pub and only a few metres from the parkland at Albert Park lake.